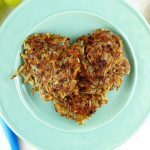 Traditional Polish Latkes given a healthy makeover into these Vegan Potato Pancakes - perfect for Valentines Day breakfast with the one you love. Grind the chia seeds into a meal using a mortar and pestle or a coffee grinder. Add the water, stir together and then set aside to thicken. Wash the potatoes well and dry them on a clean towel. Into a bowl, grate the potatoes with the skins on using a cheese grater. Into the same bowl, grate the onion. Take a clean kitchen towel and pile the grated potatoes and onion onto the center. Gather the towel around the potato and onion and, over the sink, squeeze out as much of the liquid as you can. Return the potato and onion to the bowl. Add the salt, pepper, garlic powder and chia seeds to the mixture in the bowl and mix to combine it well. Add the flour to the bowl and mix again. In a large pan, heat about a tablespoon of coconut oil over medium heat. When the pan is hot, drop large spoonfuls of the potato mixture onto the pan and spread it out a little using the spoon so that it is round and flat. I cooked 3 at a time. Cook the pancakes on each side for 5-6 minutes, until they are very brown. You can push down on them every so often with a spatula to make sure they are crisping up. Serve with sour cream or apple sauce. If you have a food processor, it most likely comes with a grating attachment, which would make the process a lot faster and easier.